My name is Cappy and I've had this cool webpage for quite a few years now. 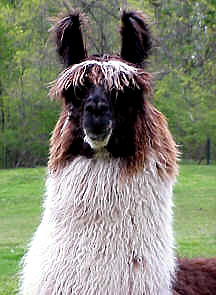 A special page just for llamas, pets, and all animals to chat and share both our joys and problems. I've had quite a lot of experience over the years and earned many awards as I traveled to shows. In addition to llama shows, I always liked to keep busy going on walks in the woods, watching over the new crias in the pasture, wading in the creek, working out on the obstacle course, and even cart driving. Over all these years I've received a lot of emails from many different pets looking for advice on various issues. Cappy's Corner provided a well needed sounding board for all animals who were looking for advice on training their human owners, getting along in the pastures, and performing in the show ring. Maybe you've had some of the same experiences as some of my friends on the web. I'm always ready for some fun so I've also posted a few llama games for you to try out. Fun Stuff! What's easy for a young male llama to get into and hard to get out of? Why did the llama chase the chickens out of his pasture? Why was the little white lamb afraid to talk to the llama? Some fun and challenging games all relating to llamas. Have Fun! Match all the items you'll find around the barn to reveal Cappy's mystery picture.